Give us a call for Faster Assistance. 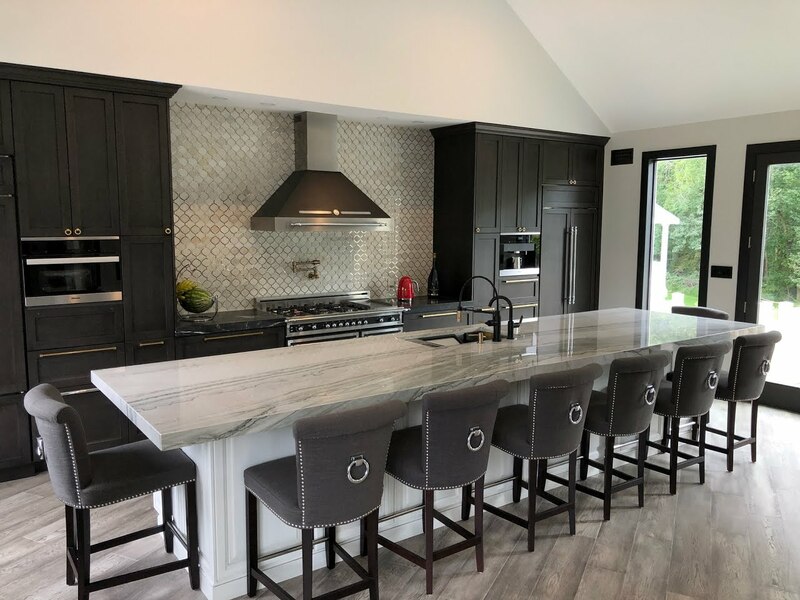 East Coast Granite offers high-end granite countertops, quartz countertops, marble countertops and more to homes and businesses in New Jersey and New York. Whether you want new kitchen counters, an outdoor barbecue, or a stunning stone bar, we have the materials and expertise to help your vision come to life. Our granite installers in Hackensack, NJ and surrounding areas are trained to provide the highest quality of craftsmanship and professionalism to every one of our customers. Your satisfaction is 100% guaranteed! Explore our counter installation services and our work gallery to get an idea of what we can do for you. When you’re ready, you can give us a call at 201-951-1457 to schedule your FREE granite counter quote. To start your custom countertop quote, draw a simple design depicting what you want your granite counters to look like. This can be a simple hand drawing, or it can be a picture of your kitchen or bathroom with dimensions written on it. Click on the image above to be directed to some of our example countertop plans, and you can see what other customers have turned in before. Be sure to include the dimensions of the counters, or at least an approximation of them so we can provide the most accurate quote possible. Place an order for your granite, marble, or quartz counters by submitting the drawing you created in the previous image. You can choose from a wide range of colors, materials, and design patterns to get the exact look you want for your kitchen counters and bathroom countertops. All of the options are clearly laid out in our online order form. If you need help selecting the right stone counters for your needs, feel free to contact us at 201-951-1457. Once we have have an overview of your design, we will schedule a time to come to your home or office. There, we will create a template for your granite countertops and provide a more detailed quote in person. From that point, we can schedule a separate time to complete your countertop installation. We offer flexible scheduling options, including night-time installations and weekend installations. For more information, contact East Coast Granite to speak to one of our quartz countertop experts. Amazing job done. Very cheap, and very professional. The job was done quick and wihtin timeframe that I needed. Highly recommend. We had been searching around online to different granite yards and came across East Coast Granite. From the moment we called they were friendly and helpful with our questions, which we had a lot since it was our first remodel. As soon as our cabinets arrived and were installed they came right out, and I think returned by the end of the week to install. They really made it a simple process and I will keep them in mind for friends and family in the future! East Coast Granite is exactly what I was looking for and what you can’t find very often anymore. They where on time, neat, and very friendly. They answered all of my question and where very reasonably priced. I am absolutely in love with the job and can’t wait to call them back for my bathroom. Thanks guys. East Coast Granite offers a variety of top-quality granite slab countertops, with colors and patterns to suit any design scheme. Take a look at some of our granite counter samples below, or view our service gallery to see samples of our previous work. If you would like to view the stone in person, you can visit our warehouse at 220 Gracie Place in Hackensack, NJ. No matter what your vision is for your kitchen and bathroom counters, our granite installers in New Jersey and New York can help you make it come to life. Choose from a wide range of beautiful quartz countertops, all sourced from top-level manufacturers in the industry. Quartz counters are a stunning addition to any kitchen, bathroom, bar, or outdoor living spaces. Whether you want a stand-alone island or a new hearth for your fireplace, our quartz installers will gladly get you set up with the perfect stone centerpiece for your home.